Salamanca in Slough is a five/six storey office block and the UK Head Office for HTC Europe Co. Ltd. The existing flat roof single ply membrane had started to break down and was in need of replacing. The main roof was generally flat with a number of smaller roofs over the lift shaft and staircases together with a significant amount of plant and pipework. A specification was prepared by Sika LPL for over coating the existing membrane with their Decothane Omega 15 liquid applied system following which we were awarded the sub-contract with main contractor Construct Design Associates Ltd. Existing falls were checked and where lacking, drainage channels were constructed within the original roof finishes prior to the application of the Omega 15 system. Working alongside the main contractor, the new membrane was applied in phases to accommodate the installation of the new drainage channels and removal and subsequent reinstatement of paving slabs and pebbles around the plant room. Pipework supports were temporarily lifted and reinstated in order that a seamless coating could be applied. The specification for the main roof included for an application of a biocidal wash and power wash followed by an embedment coat of the liquid applied one part air cured Decothane incorporating Reemat Premium followed by a further coat of Decothane in a contrasting colour. Upstands were coated using the Decothane Detail Coat. Vertical surfaces were terminated by either termination bars or sealant beneath the existing cladding and lighting conductors tapes refixed using self-adhesive clips. The paving slabs and pebbles around the plant room were reinstated on a Filtration Layer to assist in drainage in these areas. 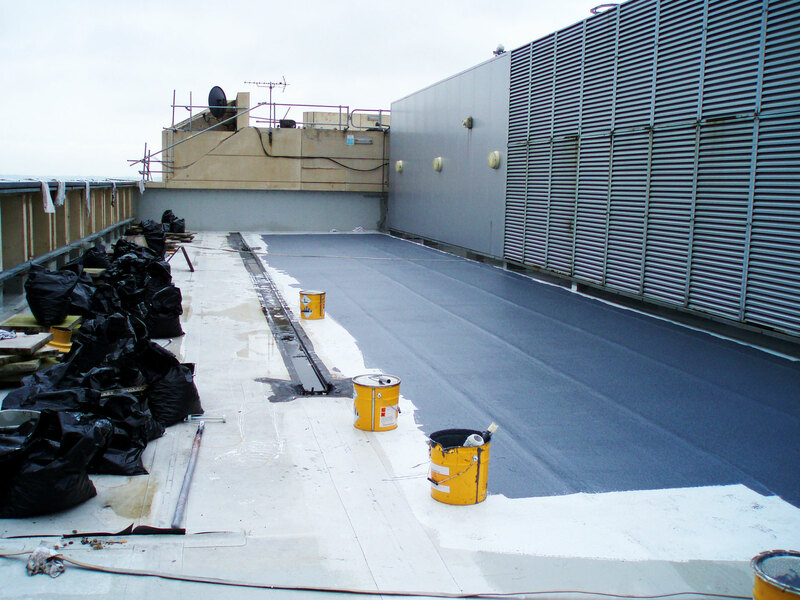 The insulation was also replaced on one of the small roofs prior to the application of the Decothane coatings using a Sika LPL Vapour Control Layer, 130mm thick Decotherm Insulation Board and self-adhesive Carrier Membrane. In total 2,000 litres of Decothane products were applied successfully with Sika LPL issuing a 15 year guarantee for the client.